It’s New Year’s Day. Let me wish you health, happiness, and prosperity in the coming year, zdrowia szczescia i pomyslnosci w Nowym Roku! (Thanks KH.) We ended 2014 with a light dusting of snow in Tucson, something that rarely happens. It will be gone by afternoon, but you know what felt more out-of-place than the snow? There was no need for the nagging reminder in the back of my mind. “Tomorrow’s a holiday. Do we need anything from the store? Better get it today!” Holidays in Poland are like stepping back into the past for me. Stores and businesses are closed. People spend time with their families. Americans have much to learn about observing holidays from the Polish. It’s not that I’m anti-business, not by a long shot, but so often, it makes no economic sense. Last year, our daughter was the assistant manager of a small store in the mall (galleria, for my Polish friends). She had the first shift on New Years Day. By the end of her shift the store had rung up $20 in sales, but if her store hadn’t been open, they would have been fined by the mall. It’s part of the lease agreement. This year, a different job, but she’s still off to work. Somethings tend to be cyclical. Let’s hope our desire for commerce 24/7 at the expense of observing holidays goes the way of American infatuation with preservatives and artificial ingredients. You can’t be efficient and productive all the time. People need rest. We need to make time for observing holidays and reflecting. There are some things in Poland that would benefit from a little Americanization, but it’s isn’t one. Are you listening, Poland? Don’t copy us on this one; holiday comes from holy day. P.S. 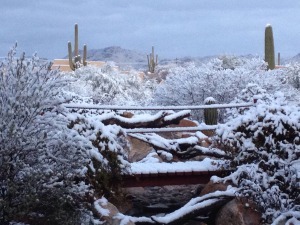 Thanks to my friend, Pat Adams, for sharing her beautiful photo of our New Year’s snow. I agree 100%!!! I have lived here for 19 years. When I first came, there were 3 days when the stores were closed: Easter Sunday, Thanksgiving, Christmas Day. Now – the stores are open every day, more stores each year decide to open during the holidays. Yes – people do need rest, people need vacation. Another issue I have is how many people are “done” with Christmas on December 26th. I don’t know about other religions, but in the Catholic church, the Christmas season is from December 24th through January 6th. Two of our neighbors threw away their trees on the 26th, only several houses on our street still have outdoor decorations. Oh well – I will keep doing what I have done – our tree is still beautiful, and the lights are on all day!! Merry Christmas!! Thank you, Kasia! I’m glad you agree. I used to attend the same church as the President of our HOA, so I know he’s familiar with Ephiany, yet I think our HOA will write you up if your Christmas lights are up after January 1st. I think we all need to get less busy. I can understand a few pharmacies being open, but other than that, let people have off and stay home with friends and family. Less busy! This is one of the main concepts I want to being home from Poland with me. Every American I know who has moved back to the U.S. has said the same thing, but I wonder if it is possible. It’s the cultural equivalent of swimming upstreM. Happy new year to you too, Joy! The hard part for me was remembering when the holidays were. It would have been easier if I was Catholic. I definitely agree with you about the holidays! I love that there are days when nothing is open here in Warsaw and hubby’s entire office is closed for two weeks. Gone are the days of work starting back on the 26th with only Jan 1 off. Of course there is no running out for a forgotten item…but who cares! Holidays are holidays and for family time!! Way to get in the spirit, Jennifer! It is kind of nice once you get used to it! Years ago I used to work in Bloomingdale’s in a SPA but it didn’t matter, I used to say that I work on Funeral Home schedule, bc FH can’t close either, there is always some dead body to take care off. That suppose to be a joke, but honestly it wasn’t funny at all. It’s the same for golf pros. Ed used to work Christmas Day because people wanted to try out their new golf clubs. Happy New Year to you too! I was talking to my brother about the exact same thing; when all stores were closed on holidays and Sundays, plus closed early on Saturday evening. It was so restful and focused the family on each other instead of cruising malls. No wonder Sunday dinners are basically a thing of the past. Sad really. We need to work on that!